It's hard to believe that local performance artist Amanda Heng, 60, is holding her first ever solo exhibition after almost 20 years of creating thought-provoking artworks. Her exhibition "Amanda Heng: Speak To Me, Walk With Me", spread across five galleries at the Singapore Art Museum at 8Q, features works like "Yours Truly, My Body", which is a video showing a younger Heng scrubbing a slab of pig meat with blood to symbolise the pain women go through to beautify themselves through cosmetic surgery. In another exhibit, Heng hangs up white dresses for baby girls and red threads to commemorate female victims of infanticide in cultures that prefer sons over daughters. Heng was conferred the Cultural Medallion award in 2010, the highest honour given to artists who have attained artistic excellence. The local contemporary artist is known for her pioneering explorations into gender and family issues in her art. This exhibition surveys over two decades of her prolific career, presenting a body of work that covers photography, installation, performance and public art. At a media tour of her exhibition, Heng cheekily talked about how one of her installations, "Tiger Balls, Myths and Chinese Man" was a response to a sexist comment made about women. She had painted several basketballs with tiger stripes and laid them out on a traditional blanket used for Chinese weddings. In 1991, fellow contemporary artist Tang Da Wu created an installation called "Tiger's Whip" to address the problem of Chinese men eating tiger penises as an aphrodisiac. "Somebody made a comment after seeing Tiger's Whip saying it's all because of women's expectation of men that men have to resort to find aphrodisiac. I wanted to respond to that comment," said Heng, co-founder of Women in the Arts. The art collective seeks to advance the feminist art movement in Singapore, a faction of art that is especially close to her heart. "Often when there's anything negative, it's so convenient to blame it on the women. During the performance, Da Wu used the sound of a bouncing basketball to represent the sound of the heartbeat. So I took that as a reference and painted the basketballs with tiger stripes," she explained. 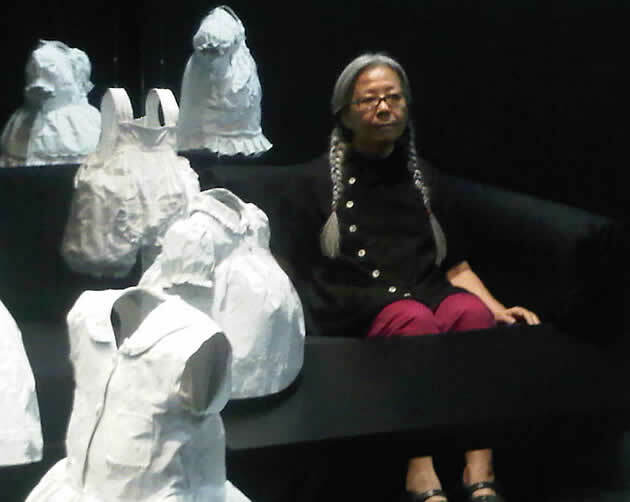 The artist in her silver-grey braids said she talks a lot about community identity and urges other Singaporean artists to find their uniqueness. "Often, there's this misconception that when you deal with things that are very specific to Singapore, the international market will not be interested in it but we are all interested in British or American or German art because they have a certain uniqueness in them," she said. "This is what we lack in Singapore and we have to work hard on that. ... When we put ourselves out there in the market, we are nowhere because we just can't compare to the people with very very strong uniqueness about them," she added. 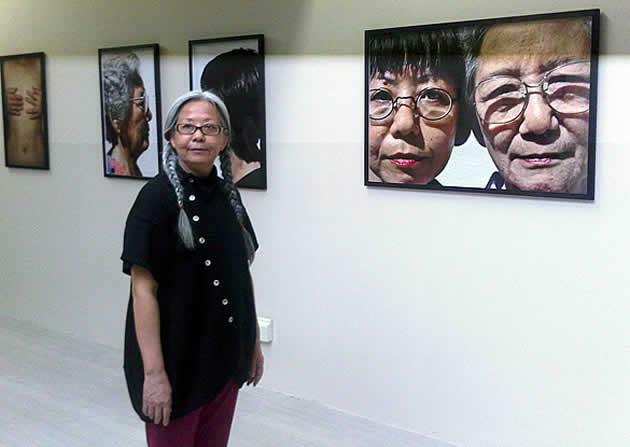 "Amanda Heng: Speak To Me, Walk With Me" is open from 7 October 2011 to 1 January 2012 at the Singapore Art Museum. The admission fees are S$10 for adults and $5 for students, senior citizens and NSFs.